Given the velocity of today’s business operations and ever-stringent data security and regulatory compliance mandates, managed file transfer (MFT) is a critical capability for enterprises. The need for greater agility at a lower cost of ownership is driving a shift toward cloud-enabled MFT solutions. Noncompliance to data security and privacy regulations and a lack of end-to-end visibility and monitoring remain the main concerns with regard to the features and capabilities of existing file transfer solutions. 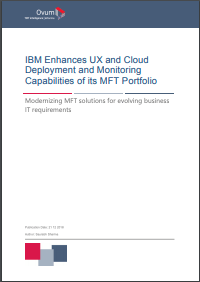 IBM continues to innovate and has introduced several new features and capabilities catering to a range of requirements for a modern and comprehensive MFT solution.